Ever wondered why you should save in gold rather than other precious metals? Here are 6 reasons why gold holds such high value. The most basic reason why gold is valued so highly is that it is rare and relatively expensive to produce compared to other metals. This is why the base price of gold is fairly high. However, gold’s high value isn’t solely because of its rarity. Gold has many uses and its physical properties are what makes it the ideal standard for money. Firstly, it serves as a store of value: Gold was the standard store of value across history because it is nearly indestructible and doesn’t rust or corrode. But what about platinum or silver? For a metal to be a premium store of value, it has to meet 2 qualities: First, it can’t be toxic, corrosive or radioactive. Secondly, it must be rare but not too rare that it’s almost impossible to find. This eliminates many other metals, leaving just platinum, silver and gold as ideal candidates for money. Silver is out because, unlike gold, it tarnishes when exposed to air. Platinum, on the other hand, may be rarer than gold but it has a higher melting point, making it much more difficult to shape into uniform units. In early civilizations, it would have been especially difficult as tools were not as advanced as they are today. Hence, gold became history’s natural choice for a standard store of value – money. Secondly, it has many uses across multiple industries: Gold is arguably the most useful and diverse metal. It’s a good conductor of electricity, does not tarnish, can be drawn into wire, alloys with other metals, is virtually indestructible, and easily shaped with high detail. This is why industries other than jewellery value gold for its diverse uses. Electronics, computers and dentistry all utilize gold due to its unique physical properties. Compared to gold, it’s easier to mistake silver and platinum for the other. This makes it easier for scams to happen. Genuine gold is easy to test with an acid test or touchstone, as shown in the picture below. You can easily determine the purity of gold in an object by rubbing it against a special touchstone and comparing the colour and quality of its scratch marks. 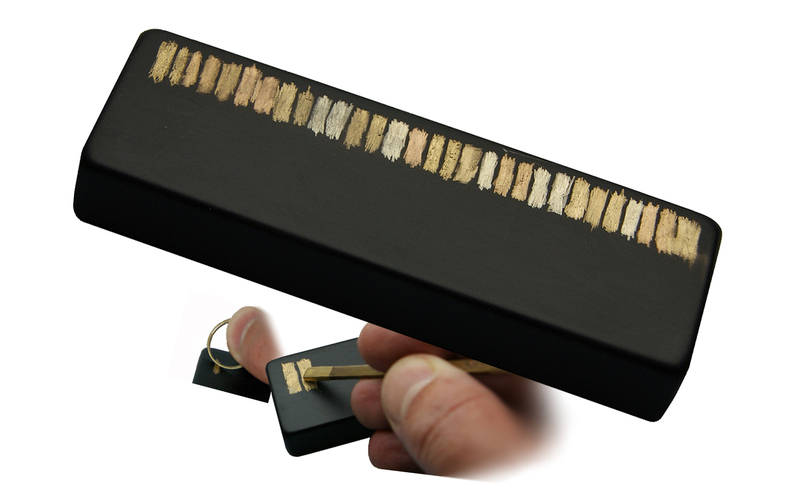 Different shades of gold colours indicate the karat quality of each tested gold. The reasons above are key factors as to why banks and central banks store gold for a nation’s sovereign funds. Governments and banks typically hold gold and not platinum or silver to protect the wealth of a nation. If you look at countries around the world, platinum has had a very short financial history. You’ll find that the largest platinum ETF in the world barely amounts to 100mil USD in assets under management. In contrast, the largest gold ETF in the world amounts to about 35B USD while the total ETF of gold in the universe estimates 100B USD. It’s clear that gold has a much deeper market than platinum. You’d think that silver would have a bigger market, but just the opposite is true. The total supply of silver estimates 1 billion oz. as compared to the annual supply of gold which amounts to about 120 million oz. but the gold market is 8 times bigger than silver because of the huge price difference between the two precious metals. Silver costs way much less than gold. As a result, the silver market is more volatile, meaning silver will rise more than gold on good days, and fall more than gold on down days. When it comes to price stability in the markets, gold has an unprecedented record as compared to the higher volatility of silver. Silver is often referred to as ‘poor man’s gold’ because it was significantly cheaper to afford silver than gold. All this has changed with HelloGold’s progressive fintech designed for the everyday Malaysian. Today, you don’t need a big wallet to start saving in gold. From as little as RM1, you too can own gold as a long-term investment for your future. Compared to gold, no other precious metal has proven a richer and deeper history as a financial product. The trust banks and governments have in gold, its stability in the markets, its unique physical properties and affordability is why gold stands as a premium, accessible, long-term store of value and will likely remain so for years to come. Download HelloGold now and start saving gold from as little as RM1! Have more questions about why you should save in gold? Drop us an email and ask us anything at [email protected]!